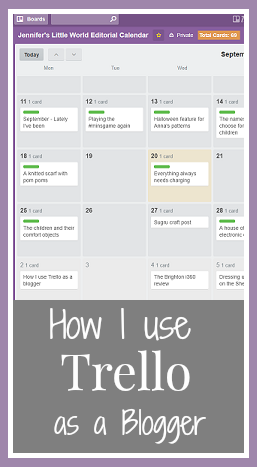 I've been using Trello to organise my blog for well over a year now, and I love it! 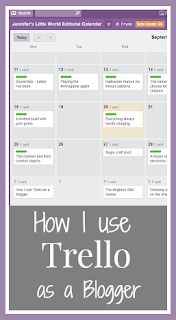 After trying out a few different systems based on those used by other bloggers I found my own that worked for me, so I thought I'd share how I use Trello, both as an editorial calendar for my blog and as a blog post catalogue to keep track of my published posts. Trello is an online organisational tool that uses cards, lists and boards to keep track of your tasks and projects. I use the free version, which is more than enough for my needs. 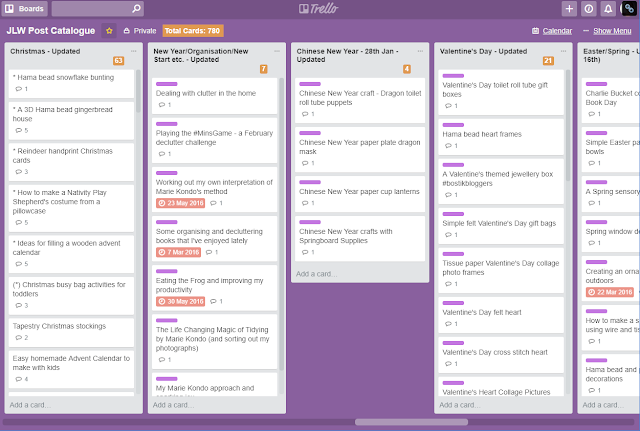 I use Trello by myself, but it's also great for collaborative projects - for example, if you are running a blog with several contributors you can keep track of the work that others have done and see where you are up to. In my system, each Card represents an individual blog post. I use Lists to categorise and organise my cards, and then these lists are stored on Boards. I use three boards for my blog - Jennifer's Little World Editorial Calendar, JLW Post Catalogue and JLW Post Catalogue not to be reshared. My editorial calendar board deals with blog post creation, following them from vague post ideas through to published posts. It allows me to see at a glance which posts I have written, which posts I need to write, and to fill any gaps in content. Each card in my Trello system represents a blog post, whether it's just an idea or a finished and published post. I have the following five lists in my Editorial Calendar board - Seasonal Ideas, General Ideas, To Write, Finished and Scheduled, and Published. This board has the Calendar Power-Up enabled. This means that when I have set a due date for the post it will be displayed in the calendar view. I begin planning blog posts by writing down potential titles on separate cards under Seasonal Ideas or General Ideas. The Seasonal Ideas board is useful if I have an idea for a blog post in a different season, then when that season approaches I have a small bank of ideas to start with. If I have any additional notes they can be added to the card, for example previous blog posts of mine that I want to link back to, any credits for inspiration, and any other notes that came to mind when I thought of the blog post idea. Then I flick over to the Calendar view so that I can see where my gaps are and I schedule in blog posts for the next couple of weeks, setting a due date for the post. In the screen shot below you can see the first few weeks of September 2017. Some of the posts have final titles, others are just ideas. When a post has been written and scheduled I change the label to green. The cards without a label are the posts that I need to get on and write. If I want to make changes I can easily drop and drag the cards around in this view and the due date will change automatically. Back in the list view for the board, when I've written a post I drag it over to the Finished and Scheduled list, then when it has been published I drag it to the Published list. I also add the link of the final published post to the card. Every week or so I move the cards in my Published list from the Editorial Calendar board to one of my Post Catalogue boards. I have two Post Catalogue boards, as my original board was starting to become too full. I have one board for blog posts that I don't intend to re-share. These are update blog posts that I've written, family and parenting posts, that sort of thing. I really enjoy looking back over them but they are probably not going to be relevant to future readers. My main Post Catalogue board holds all the blog posts that I will want to re-share. I make sure that each card has a link to the published blog post and any other information, for example the Twitter handle of any contributor or inspiration. Then they are sorted into quite detailed lists. So for example I have a list for each season - Halloween, Christmas, Valentine's Day and so on - as well as lists for the different types of post - for example General Travel, Worldwide Travel, Accommodation Reviews and Blogging, Food, Parenting. I use a variety of different coloured labels to further categorise the posts in a way that makes sense to me. For example, if I'm going through and updating all the posts in a list I'll use a coloured label to show which ones I've done. I also use a * to mark my most popular posts. I'll move the posts around in the list by dragging and dropping, and when I've shared a post I'll move it to the bottom of the list so I know to start by sharing the posts at the top. I also use stickers to draw attention to particular posts. 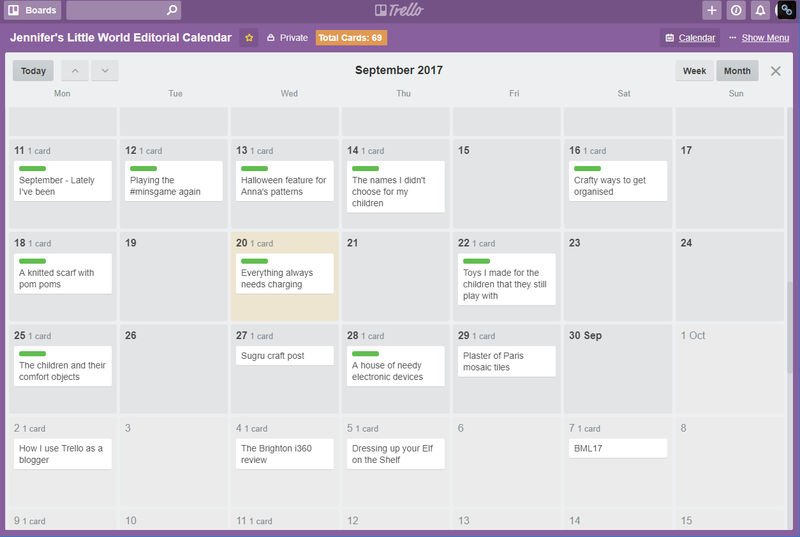 The blog posts in the screenshot below with a red date on are ones that have been published since I started using Trello to organise. I have too many posts to go back and add the published date for older ones at the moment, so it's a good way of spotting my most recent posts. I find this post catalogue really useful, as it means that when I'm looking for blog posts on a particular topic I can easily find them. It's great for creating round up posts, for example Hama bead crafts for Halloween, as I know I've not missed any posts that fit the topic. It also helps me to spark ideas for new blog posts as I consider new angles on a theme. If someone is looking for blog posts on a particular subject I can easily find all the ones that I've written to share. I use these lists for scheduling posts for my Facebook page, sharing on Twitter, and to plan my Pinterest pinning. It was also really helpful when I recently had to sort out all the images on my blog! I hope that my system makes sense, and has perhaps inspired you to have a think about using Trello for your blog! It has certainly helped me to become more organised in my blog planning.